On December 6th, Dolly Parton shared a special wish and a night of many colors with fans for more than three hours inside Austin’s sold out Frank Erwin Center, one of the last legs on her nationwide Pure & Simple tour. “Wouldn’t it be great if we could bottle up all the love and excitement in this room tonight and give everybody in the world a little bit of it?” Parton asked. The singer, songwriter, multi-instrumental musician, actress and business leader stepped out onto the stage dressed in white, sparkling in rhinestones and sequins beneath spotlights. Between songs, Parton delivered intimate stories about her childhood growing up one of 12 siblings in the Great Smokey Mountains of Appalachia, Tennessee. She made self-depreciating jokes and demonstrated an uncanny comedic ability to speak as fast as a Chipmunk at 78-RPM speed. Alternating between playing guitar, banjo, dulcimer, piano, soprano saxophone and flute, Parton sang most of her top 10 hit songs from the more than 3,000 she has written, and either she or others have performed, over the past 50 years. Following a 20 minute intermission, Parton sang tunes off 1987’s Trio and 1999’s Trio II, albums released in a box set last September, featuring her collaborative recordings with Linda Ronstadt and Emmylou Harris. Best of all, Parton invited audience participation during a medley of songs from the 1960s and ’70s: “American Pie,” “If I Had a Hammer” and “Dust in the Wind.” Her band and backup vocalists included pianist Richard Dennison, bassist Tom Rutledge and multi-instrumentalist Kent Wells– performers whose working friendships with Parton span 30 years. In the music business, that kind of longevity speaks volumes about the authenticity of the woman behind her 70-years-young voice. Honky-tonk singer, songwriter, guitarist and Lone Star beer aficionado Dale Watson provides a stout and tasty remix of 12 country music classics with his newest CD, Under the Influence. Watson covers his favorite artists’ songs that span more than 50 years – from Bob Wills’ 1939, “That’s What I Like About the South,” to Merle Haggard’s last top 40 hit of 1989, “If You Want to be My Woman.” Watson intoxicates listeners with Mel Tillis’ (Wine) Pretty Red Wine and Ronnie Milsap’s 1974 hit, “Pure Love.” The silver-haired crooner with an Elvis pompadour charms with dizzy abandon on Conway Twitty’s 1960 hit, “Lonely Blue Boy.” With earnest, he performs Lefty Frizzell’s 1958, “You’re Humbuggin’ Me,” and Little Richard’s “Lucille,” last recorded by Waylon Jennings in 1977. The Lone Stars – Don Pawlak on pedal steel, Mike Bernal on drums and percussion and Chris Crepps on upright bass and background vocals – join him on the album, along with Earl Poole Ball on piano and T. Jarod Bonta on piano. Watson rose to international fame with his 2013 appearance on The Late Show with David Letterman and breakout hit single, “I Lie When I Drink.” The founder of Ameripolitan music tours 300 days per year, and often plays Austin’s Broken Spoke or the Big T Roadhouse near San Antonio. 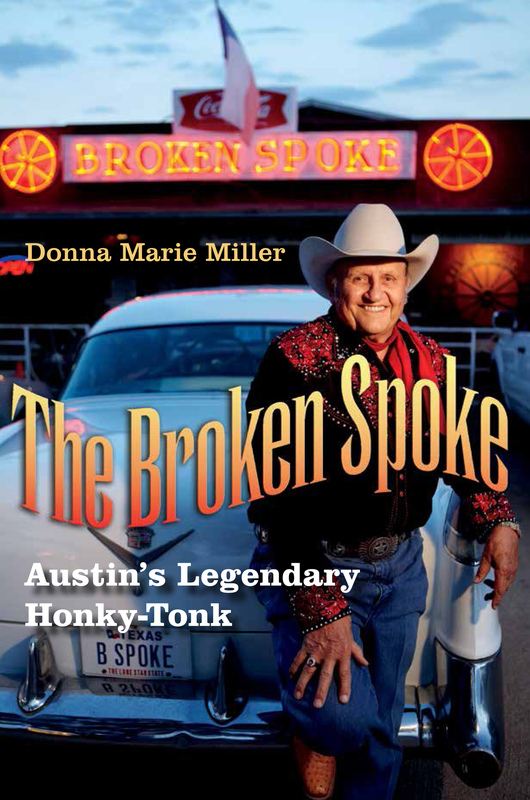 Honky Tonky Heaven: The Legend of the Broken Spoke both enchants and mesmerizes with 75 minutes of true stories from co-founders James and Annetta White and friends about Austin’s 52-year-old state treasure. The Wild Blue Yonder Films crew, including directors Brenda Mitchell and Sam Wainwright Douglas, and directors of photography Lee Daniel and David Layton, worked behind the scenes for more than two years to capture the story of the Broken Spoke in interviews and in intimate details. Cast and crew, together with producers Jenny Holm and Michelle Randolph Faires, celebrated on November 9th with a DVD screening and release party inside the Broken Spoke. About 200 people attended the event, including executive producers Scott Mitchell and Maria J. McDonald and contributors to the $62,000 Kickstarter campaign. In the film, James White describes how, beginning in 1964, he booked Bob Wills, Ernest Tubb, Kitty Wells, Roy Acuff, Willie Nelson and George Strait. He expanded the Broken Spoke’s list of entertainers in the 1970s to include Jerry Jeff Walker, Gary P. Nunn, Ray Benson and Alvin Crow. By the 1990s, Cornell Hurd, Dale Watson and Jesse Dayton joined the scene. Meanwhile, Annetta White has regularly cooked up batches of her famous chicken fried steak and cream gravy. Together, the Whites and their daughters, Ginny White-Peacock and Terri White, discuss how they have managed to keep the family business afloat for half a century. The roof leaked, at one time a tour bus drove through the back bar and a neighboring multi-use commercial multi-million dollar development threatened its future, but still the Broken Spoke survives. Terri teaches dance lessons, while Ginny acts as business manager and sews “bling” onto her father’s vintage western shirts. James White’s colorful, Gene Autry-style costumes with wide roped yolks and five-snap button cuffs have become his trademark at the dance hall door as he greets visitors with a smile and a handshake. Footage of live performances, one-of-a-kind country music memorabilia and the best dancers anywhere shine beneath its neon lights to make this visual story unforgettable. The documentary won the “Audience Award” at the 2016 SXSW Film, Music and Interactive Festival. Worldwide Broken Spoke fans and newcomers alike may now experience the thrill of a real Texas honky-tonk from the comfort of their own homes. Fowler’s unique hook phrases and outstanding musicianship by Scotty Sanders on steel and J.T. Corenflos on electric guitar deliver another potential number one hit, “He Ain’t No Cowboy.” However, a comical take on hip hop music– “Sellout Song”– co-written by Fowler and Zane Williams, promises to be a fan favorite. San Antonio native singer/songwriter Dennis Jay collaborates with some well known Austin musicians including multi-instrumentalist and music producer, Lloyd Maines, on his newest CD, Western & Country. While Jay’s high tenor vocals and yodeling deliver some emotional lyrics, Maines’ superb performances on steel guitar, as well as bass, percussion and spoons make the album memorable. Kudos too to locals Terri Hendrix on harmonica, Bukka Allen on piano and accordion, drummer William Mansell, Jimmie Scott Calhoun on upright bass, Howard T. Levine on lead guitar and Richard Bowden on fiddle and trumpet. Since the 1980s, Jay has performed throughout Central Texas in honky-tonks and beer gardens, solo or with his Lonesome Town band. Together Jay and Maines co-wrote “Texas Skies Shining in a Cowgirl’s Eyes,” a lyrically sparse song that instrumentally conjures up the spirit of the late great Western Swing bandleader Bob Wills. Vocally, Jay performs best solo on banjo for a version of the folk music standard, “Streets of Laredo,” also known as “The Cowboy’s Lament.” Fans of classic country may enjoy Jay’s album infused with Mexican language and reminiscent of the late great crooners Hank Williams, Ernest Tubb and Lefty Frizzell. In his newly released DVD, Keepin’ It Country: Live at Red Rocks, Alan Jackson spins tales and sings hit songs he or others have written that topped the country music charts over the past three decades. Simply dressed in a pair of boots, jeans, western shirt, and a white five-gallon hat, the country traditionalist recorded the last concert of his tour in May of 2015 before a huge crowd at Colorado’s Red Rocks amphitheater. The Georgia native was one of seven siblings and worked various blue-collar jobs before marrying at 19 and starting his music career at Arista Records in 1989. Those experiences reveal themselves in songs such as “Here in the Real World,” the title track off his 1990 debut album, and “Livin’ on Love” which was released in 1994 on Who I Am. Jackson blends honky-tonk and contemporary mainstream country music with “Chasin’ that Neon Rainbow” and “Drive,” both stories about his dad. He also covers: “Little Bitty,” “It’s Five O’Clock Somewhere,” and “Pop a Top” complete with that unmistakable sound made by pulling the tab on a full can of beer. Jackson fans and first timers alike will feel inspired to dance in their living rooms and sing along to his lyrical tunes.